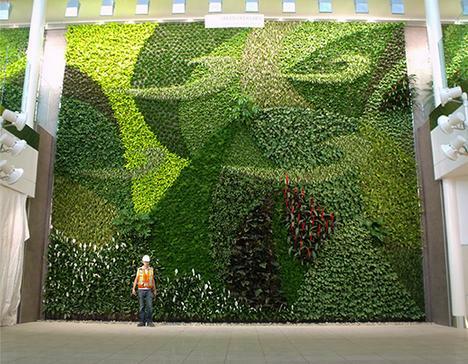 The idea of creating a green wall may not be new, after all people have been growing ivy and other vines on their homes for centuries, but a Canadian company, Green Over Grey has brought the concept to new heights. With modern techniques and hydroponic planting, the company is able to install huge living walls on the sides of cooperate buildings. These walls include a wide variety of plants and weigh far less than any other planting method like this. Another advantage to Green Over Grey’ s technique is that the plants are irrigated in a way that not only keeps them alive but is not wasteful. The plants can be designed in a variety of styles and each installation is individualized to the climate and the customer’s needs. Businesses that use this living wall technology also receive LEED benefits, a decrease of up to 20% in their electricity costs, and benefits to employees such as increased air quality and a reduction in noise pollution. It is not only businesses that can benefit from these living walls. Individuals can also have living walls, called vertical gardens, installed inside or outside their homes. From bringing life into the house to giving new life to your house, these installations are easy to maintain and stay green year-round. To find out more and view their gallery, check out Green Over Grey’s website at: http://www.greenovergrey.com. if I have something to add to the discussion. It is triggered by the fire communicated in the post I read. green tech blog. I was moved enough to drop a thought 😉 I actually do have some questions for you if you tend not to mind. Someone necessarily lend a hand to make significantly articles I might state. I’m hoping to create my very own blog and want to know where you got this from or just what the theme is called. Kudos! capable of easily understand it, Thanks a lot.